When Jamie Summerlin felt the calling to do something more meaningful with his life, the former U.S. Marine came up with an extreme idea. His desire to bring attention and assistance to wounded veterans led to a 100-day, 3,452-mile run across America. His journey was intended to inspire those who sacrificed for America’s freedom, but along the way Summerlin realized he was the one being inspired. 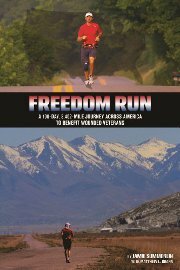 This book not only tells the story of Summerlin’s amazing run across America and his attempt to raise money for the Wounded Warrior Project and other similar charities, but it reveals the heartfelt stories of the many veterans he met along the way. Beginning in Coos, Oregon, and ending in Rehoboth Beach, Delaware, Summerlin’s trek across the nation and the stories of the veterans he encountered serve as an inspiring and eye-opening tale of courage, determination, and honor in America.